Now everyone can record music with professional quality on Spire Studio, the most versatile mobile recording system ever made. Simplifying the recording and editing process, the wireless, portable audio device features a built-in, professional microphone, two inputs with Grace Design preamps, and award-winning sound processing technology delivering high-quality recordings. A simple LED touchscreen allows you to adjust volume, mute audio, and delete tracks without slowing your musical flow. Add studio quality creative effects like reverbs and delays, which you can hear back in real time. 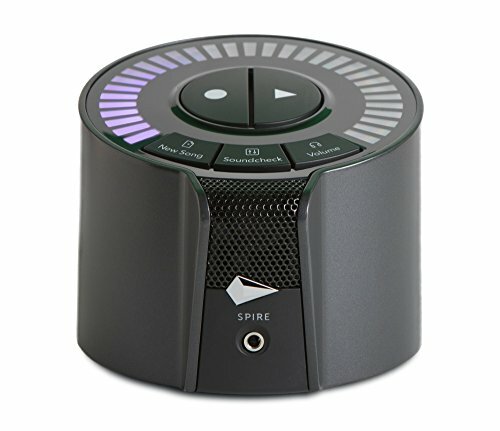 Edit, mix, and share recorded music instantly via Wi-Fi connection between Spire Studio and the Spire app, a powerful multi-track recorder, which is controlled with simple, intuitive gestures. Portable, wireless and battery operated, Spire Studio fits into a backpack or guitar case, so you have a professional studio with you at all times. Automatically set recording levels with a single button to eliminate set-up time and distorted sounds. You and your bandmates can plug in your musical instrument of choice to XLR/TS combo jacks with pristine clarity. Spire Studio can even power your own mic with 48V Phantom power, and automatically syncs tracks between hardware and software for seamless version control. Whether capturing a moment of inspiration or collaborating with bandmates around the globe on your latest tracks, iZotope’s Spire delivers a new kind of recording experience. NO SET-UP: Simple recording with a built-in wireless connection to the Spire app - record, edit, mix and share tracks from your phone. STUDIO QUALITY: Built-in, professional microphone with award winning sound processing technology and studio quality audio effects. PORTABLE RECORDING: Spire Studio fits into a small bag, backpack or guitar case - record music anywhere, anytime with built-in Wi-Fi. If you have any questions about this product by iZotope, contact us by completing and submitting the form below. If you are looking for a specif part number, please include it with your message.